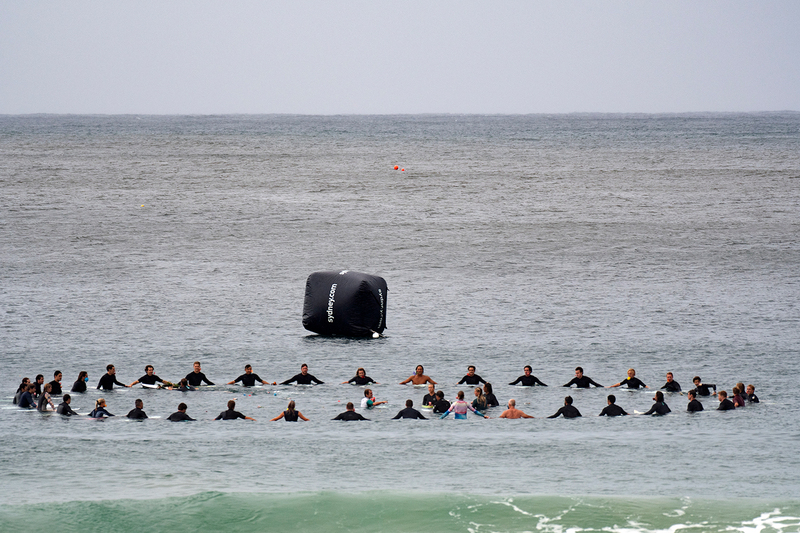 Surfers competing in the Vissla Sydney Surf Pro at Manly have paid their respects to the victims of the Christchurch terror attack and shown support for the people of New Zealand with an emotional paddle-out and message of ‘Kia Kaha’. New Zealand surfers Billy Stairmand and Ella Williams led a group of more than 30 international and local surfers beyond the breaking waves where they formed a circle around floral wreaths. Speaking to the group in the water, Stairmand paid respect to the victims of the horrendous attack and expressed support for the families affected and the people of New Zealand, generating a teary response from many in the circle. “It’s so hard being far away at a time like this, but we are all thinking of everyone back home,” said Stairmand. A moment’s silence followed as the surfers sat on their boards with heads bowed and people watched solemnly from the beach in light rain. At the end of the silence, the circle of boardriders splashed the water and threw flowers into the air. Surfing NSW Chairman John O’Neill said the surfing community gathered at Manly for this week’s event has been greatly saddened by the tragedy in Christchurch, particularly with many New Zealand surfers taking part in the competition. "On behalf of Sydney's surf community, surf organisers and surfers from around the world gathered in Manly - and especially our New Zealand surf fraternity - we pay our respects and offer our deep condolences to the many bereaved friends and families. Kia Kaha. Stay strong New Zealand,” said O’Neill. Member for Manly, James Griffin MP, added a message of support to the paddle-out. “On behalf of the community of Manly, and everyone competing at the Vissla Sydney Surf Pro, our thoughts, prayers and love go out to all those impacted by the tragic events in Christchurch. We are all stronger together,” said Griffin.